Transform a simple plate of pasta into a delicious feast. This easy-to-prepare meal is high in flavor yet low in guilt, making it the perfect answer to an empty stomach. 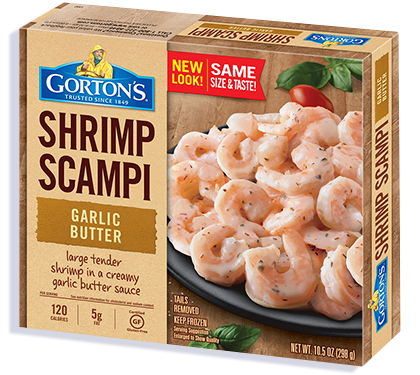 *FULLY COOK SHRIMP TO AN INTERNAL TEMPERATURE OF 165ºF OR HIGHER BEFORE SERVING. 1. Arrange 6-7 frozen shrimp in a single layer in a morivwave safe bowl and cover loosely with plastic wrap. 2. Microwave on HIGH for 3 to 5 minutes, stirring halfway through cooking. 3. Let stand for 1 minute to complete cooking, and stir before serving. Water, sunflower oil, buttermilk, maltodextrin, gelatin, modified food starch (corn, potato, tapioca), salt, garlic powder, sugar, natural flavor, whey, cream powder, spices, butter (cream, flavor), onion powder, sunflower lecithin, xanthan gum, dehydrated red and green bell pepper, citric acid, romano cheese (milk, cheese culture, salt, enzymes), vinegar, parsley, colored with paprika and turmeric extracts. 60mg of EPA and DHA Omega-3 fatty acids per serving.